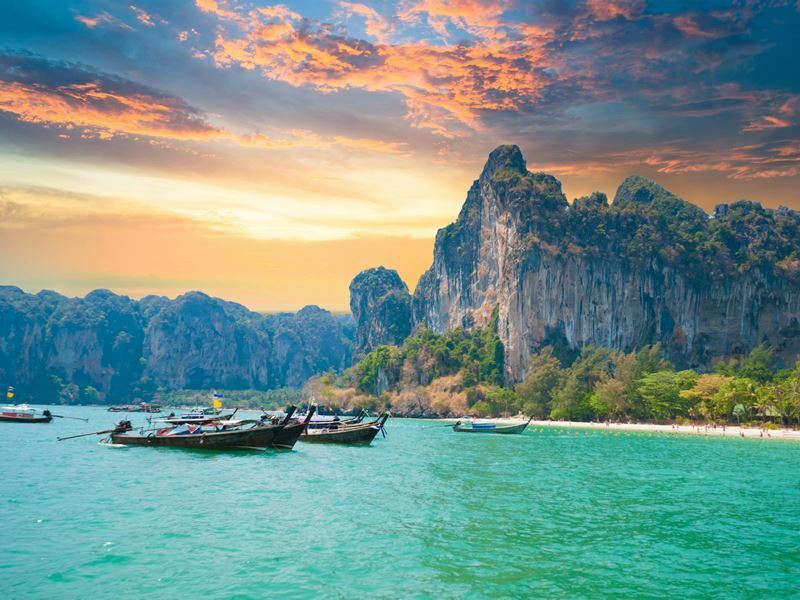 Thailand has some of the most diverse scenery in Southeast Asia, from soaring mountains to tropical islands and steamy rainforests. 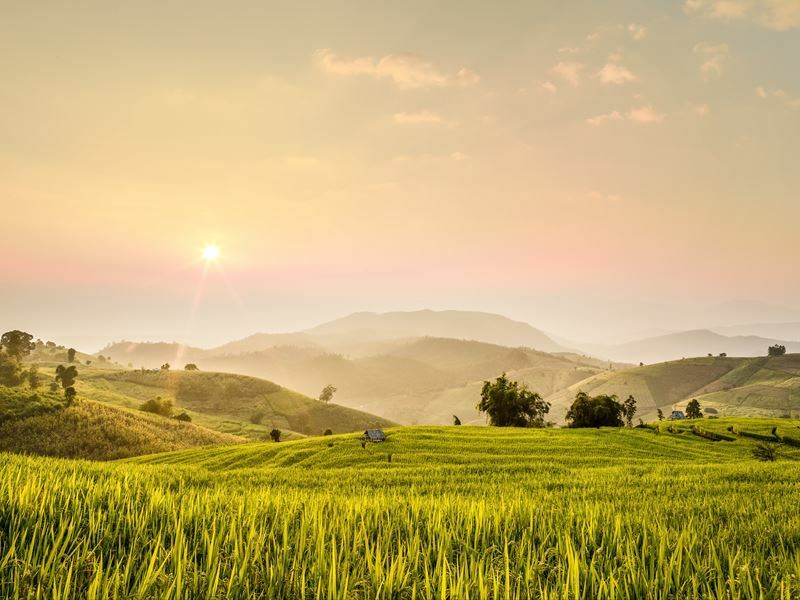 A holiday in Thailand can see you hopping from tea plantations and hill tribe villages in the north to Asia’s rice bowl in the central plains and the south’s palm-encrusted islands. If you’re planning a Thailand holiday, here are some of the country’s top scenic locations you shouldn’t miss. Thailand lies at the heart of Southeast Asia and is bordered by Myanmar to the northwest and Laos in the northeast, Cambodia in the east and Malaysia in the south. The country covers an area of 513,000 square kilometres, over twice the size of the UK, and its biodiverse landscapes are protected in 127 national and marine parks. These are filled with rare and endangered wildlife including Asian elephants, tigers, bears and monkeys. Tourists also flock to the Land of Smiles to enjoy paradisical islands and spectacular beaches on both the Gulf and Andaman coasts. Thailand is speckled with mountain ranges but the tallest are located in the north, particularly along the Burmese border. This area is rich in forested peaks with steep river valleys and rolling tea plantations. The best time to visit is in the cool, dry season but be aware that temperatures can drop to single figures in January and February, especially up in the mountain villages. The three tallest peaks in Thailand are found in Chiang Mai province in the north. 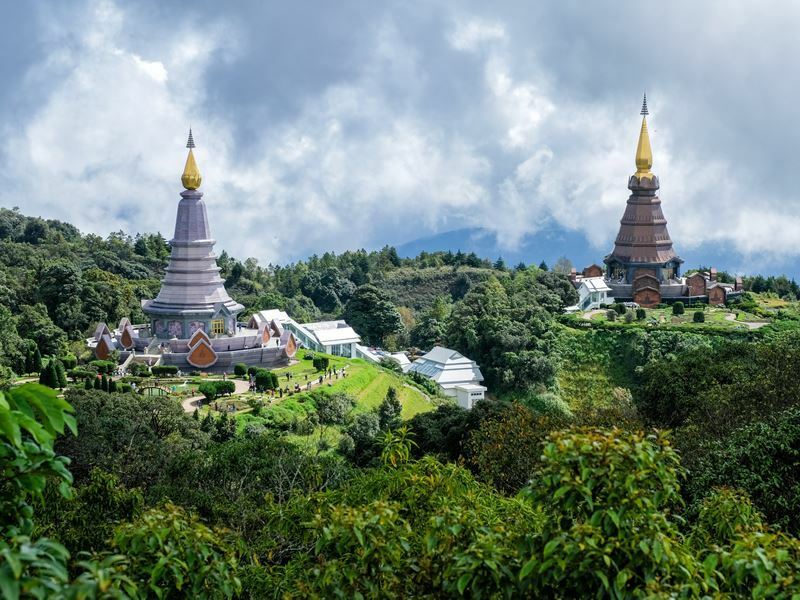 From Chiang Mai city, you can make the two-hour journey to Doi Inthanon, the country’s highest peak which sits at 2,565 metres above sea level. There’s a road to the summit and nature trail at the top with superb jungle trekking in the surrounding national park where you can see waterfalls, caves and stupas. In late January, the park blooms with pink Siamese Sakura flowers and the area is popular all year-round with bird watchers. Doi Pha Hom Pok, the country’s second-tallest peak at 2,285 metres, sits in its own national park on the Burmese border three hours from Chiang Mai. Hike to the lesser-visited peak for great sunset or sunrise views, then explore the park’s hot springs, geysers and admire its array of alpine flowers. Doi Chang Dao, a two-hour trip from the city, is a 250-million-year-old limestone mountain that soars to 2,175 metres, making it the country’s third-tallest peak. The eight-hour return trek to the summit has been named one of the best day hikes in Thailand and from the top you get sweeping views over the Daen Lao mountain range. The unique Chinese-influenced village of Mae Salong is also nestled in the Daen Lao mountains and has views of tea plantations rising like staircases towards mist-topped peaks. In the 1960's the village became a refuge for exiled Chinese soldiers who made money selling opium to Burmese drug barons. Today, it’s oolong tea rather than opium that’s grown in Mae Salong and the surrounding valleys are grooved with tea bushes. You can visit nearby Wang Put Tan and Choui Fong plantations for viewpoints and tasting sessions. Around 30 percent of Thailand is covered in dense forest, home to thousands of animal and plant species. These forests are largely preserved in national parks spread around the country and are accessible all year-round, but be prepared with wet weather gear in the rainy season. Note that Umphang Wildlife Sanctuary experiences very cold weather during November and December. Khao Yai is Thailand’s oldest and most visited national park. Located just three hours from Bangkok, Khao Yai is designated as a UNESCO heritage site and is regularly touted as one of Asia’s top parks. Explore over 50 kilometres of walking trails through evergreen forest, rainforest and grasslands featuring towering waterfalls, caves and mountains. It’s possible to spot wildlife such as elephants, bears, deer, gibbons and over 300 bird species in Khao Yai. Down south in Surat Thani province, you’ll find Khao Sok National Park, which is said to be the world’s oldest tropical evergreen rainforest. The park is known for its biodiversity and has over 200 floral species per hectare and 48 animal species, including clouded leopards, langurs, sun bears, elephants and 311 bird species. Stay in a raft house overlooking Cheow Lan Lake to immerse yourself in the sights and sounds of the rainforest. Umphang Wildlife Sanctuary is a UNESCO site located in the northern province of Tak. Its highlight is the country’s most impressive waterfall Thi Lor Su, which is around 500 feet wide and 300 feet high, making it one of the five largest waterfalls in Asia. The name means ‘black waterfall’ in the Karen language, one of the ethnic groups that inhabit the area. Umphang is made up of evergreen and deciduous forest dotted with caves, mountains and wildlife including leopards, tigers and hornbills. Thailand has some vibrant cities full of history, culture and modernity. 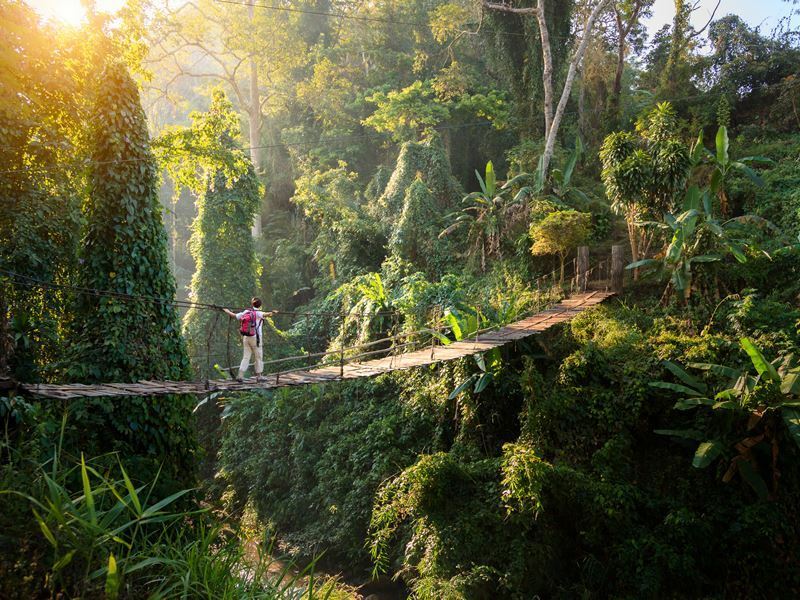 Most tourists start their trip in the bustling capital Bangkok and visit the northern city of Chiang Mai, a jumping off point for jungle treks. 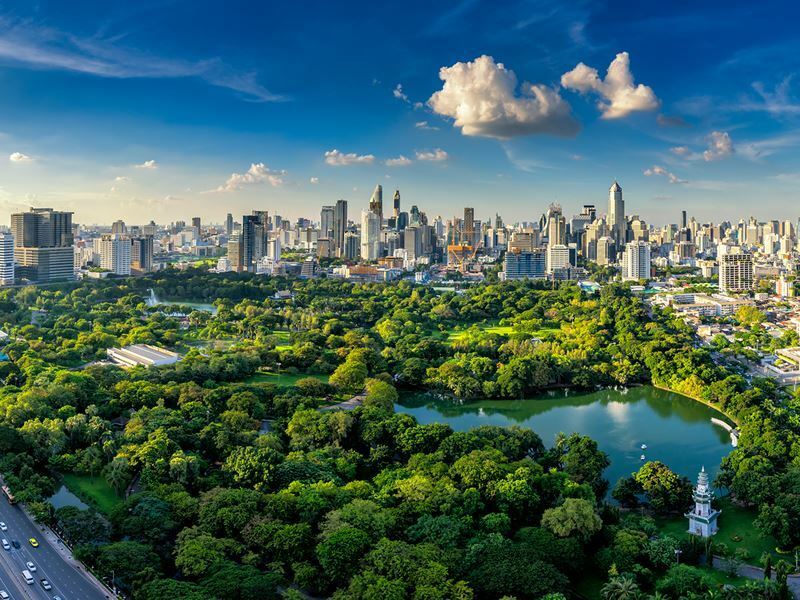 The best time to visit both cities is during the cool season, avoid visiting during March and May when temperatures can reach a sweltering 35 degrees in Bangkok and burning season in the surrounding hills means poor air quality in Chiang Mai. Bangkok is Thailand’s capital in every sense of the word, a thriving cultural, royal, business, political and transport hub. The city is home to over eight million people including roughly 13 percent of the country’s population, as well as expats from all over the world. In amongst Bangkok’s modern skyscrapers, office blocks, rooftop bars and megamalls, you’ll find traditional Thai history and culture. Top sights are based in the Ratanakosin area and include the glittering 18th century Grand Palace, 46-metre-long reclining Buddha at Wat Pho and riverbank temple Wat Arun. Don’t miss Bangkok’s sprawling Chatuchak weekend market, Lumphini Park, Chinatown and the backpacker haunt Khao San Road. It’s also worth cruising along Chao Phraya River and exploring the city’s network of canals, known as the ‘Venice of the east’, by longtail boat. Chiang Mai, the 13th century capital of the ancient Lanna (northern) Kingdom, is now a trendy university city known for its art, culture and coffee-shop scene. The old city sits just west of the Ping River and is surrounded by crumbling walls and a moat. Wander Chiang Mai’s leafy streets to discover over 300 Buddhist temples where you can converse with orange-robed monks. Don’t miss the view over the city from the sparkling temple on top of Doi Suthep mountain and take a cooking, meditation or massage class. Up to forty percent of Thailand’s population earn a living from farming, mainly through harvesting rice in the country’s lowland, central plains. Here the landscape is drained by the Chao Phraya River, creating a basin known as the ‘rice bowl of Asia’. This area has beautiful paddy fields, floating markets, forests and the ruins of ancient cities. Visit during cool season for the best weather conditions. Kanchanaburi sits at the junction of the Khwae Yai and Khwae Noi rivers and is surrounded by rice paddies and rugged mountain ranges. 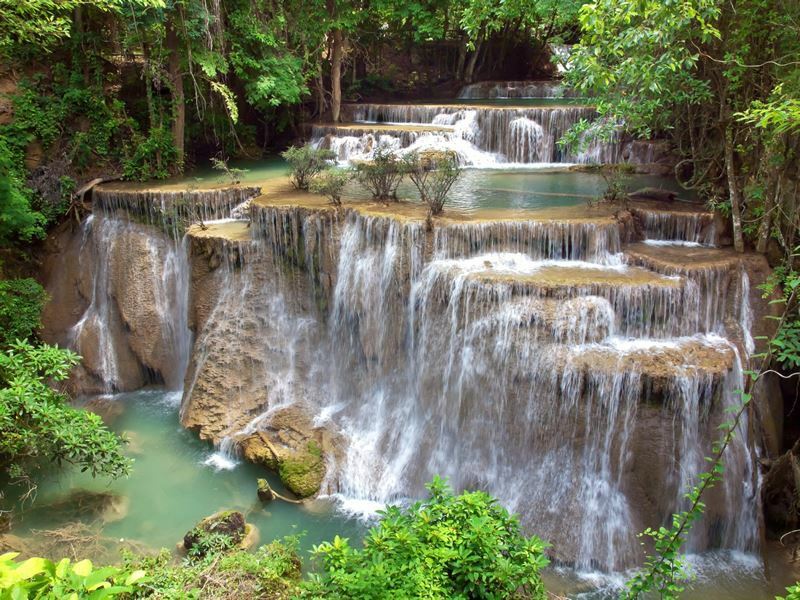 Stay in a riverside bungalow and take a trip to nearby Erawan National Park to see its staggering seven-tiered waterfall. Kanchanaburi is famous for its WWII history and Death Railway, so-called because around 240,000 allied prisoners of war and Asian labourers died while constructing it. Learn about this history in Kanchanaburi’s war museums and ride the scenic railway line to infamous Hellfire Pass. Just 80km north of Bangkok you’ll find the ruins of Ayutthaya, which was the capital of Siam for around 400 years. At its height, it was one of the world’s richest cities and an international trading port until Burmese forces took over in 1767, forcing Thai rulers to create a new capital, Bangkok. Today, Ayutthaya Historical Park is an archaeological and UNESCO site where you can explore the remains of palaces, temples, monasteries and grand statues by bicycle to get a taste of Thailand’s fascinating past. For more stunning Thai countryside, head west of Bangkok to Ratchaburi Province to explore Damnoen Saduak, which is known for its floating markets. Hire a wooden longtail boat to take you along the labyrinth of canals to the 100-year-old market. Buy fruit and snacks from locals, barter for handmade souvenirs and catch views of the surrounding vineyards, rice paddies and orchards. Thailand has over 3,000 miles of coastline and the most picturesque stretches can be found in the south, where temperatures are consistently high. Visit during the cool season on the Andaman Coast as the rainy season hits hardest on this side. On the Gulf side, avoid the north-east monsoon between October and December and visit between January and March. 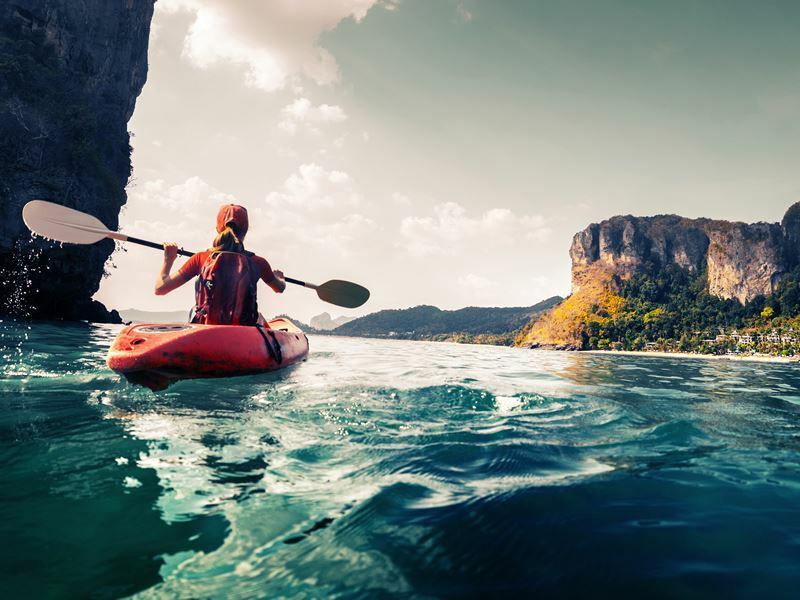 Krabi is one of Thailand’s most popular coastal destinations and the launching pad for islands on the Andaman coast such as the Phi Phi archipelago and Koh Lanta. Chic resorts sit on Krabi’s golden beaches backed by thick forests, with views stretching across the limestone karst-studded sea to Phang Nga Bay. From Krabi you can visit wide, sandy beaches like Railay and Ao Nang, which lie just 45 minutes away. You can also take boat tours of the nearby mangrove swamps or go trekking, rock climbing and kayaking. Further up the Andaman coast you’ll find tranquil Khao Lak, a string of quiet beaches stretching along Phang Nga’s west coast. The area is bordered by the forested hills of national parks such as Khao Lak-Lam and lies 70 kilometres north of Phuket. 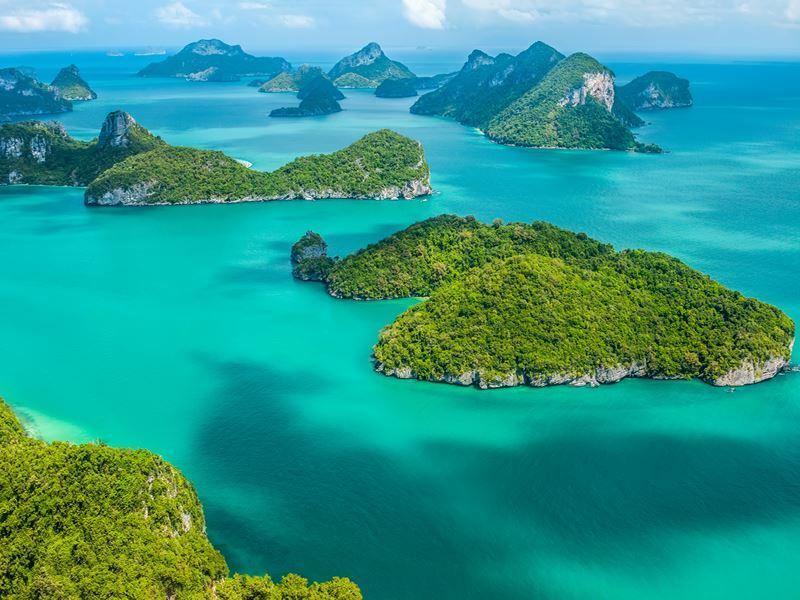 From Khao Lak you can day trip to the Similan Islands and explore nearby Khao Sok National Park where you can visit Elephant Hills, an ethical, immersive elephant experience with a luxury tented jungle camp. Thailand is famous for its heavenly islands with palm-fringed white sands and clear, coral-rich waters teeming with marine life. There are hundreds of islands to choose from spread off both the Gulf and Andaman coasts. January until mid-March is the best time to visit the Gulf islands, as it’s sunny with a fresh breeze, while November until January is best on the Andaman Islands. On the Gulf coast, the most common island-hopping combination is Koh Tao, Koh Samui and Koh Phangan, which are all no more than an hour from the other by boat. While Koh Samui is known for its luxurious resorts, spas and restaurants, Koh Tao is the country’s top diving and snorkelling destination. Every month, over 30,000 people flock to Koh Phangan for its legendary Full Moon Party on Haad Rin beach. The Andaman coast is laced with mangrove swamps and the sea scattered with craggy limestone outcrops in Phang Nga Bay. Here you’ll find some of Thailand’s best islands, including its largest Phuket which has lively nightlife in Patong and chic resorts at its quieter southern tip. Koh Phi Phi Le is famous for its Maya Bay, which was a setting in the Leonardo DiCaprio film The Beach. Families and couples tend to head to laid-back Koh Lanta, while the Similan Islands have been ranked one of the best dive destinations in the world. To get a taste of all Thailand’s varied landscapes, begin your tour in Bangkok and take day trips to the central plains. Next, head north to explore Chiang Mai which you can use as a base for jungle trekking and elephant experiences. End your trip with some rest and relaxation down south with a coastal beach break, some island-hopping or a Thailand cruise.